Big Island Pond is a 532 acre lake located in the towns of Derry, Hampstead and Atkinson New Hampshire.The lake has a long and varied history going back to the aboriginal peoples and the possible settlement nearby of Irish Culdee monks over 1,000 years ago. Chief Escumbuit's life from 1665-1727 intertwines with the history of the Big Island Pond. Into the twentieth century there was even a brothel located near the pond called "Laverne's Place." All of the interesting history is available in the book "Legends of the Pond, Stories of Big Island Pond, Atkinson, Derry and Hampstead" by Alfred E. Kayworth. Mr. Kayworth's book gives a fascinating look at the pond and the people who have lived nearby. One interesting character on the pond was George Eli Whitney. "Derry from Turnpike to Interstate,' says that "For nearly fifty years a steamboat provided enjoyable trips on its waters. It was unique in that the man who built the boat in 1900 operated It for forty eight summers. He was George Eli Whitney, a descendant of Eli Whitney, inventor of the cotton gin. No Sunday school picnic or family reunion at the pond was complete without a ride on Whitney's steamboat. At a certain point along the way, in a shaded cove, Whitney always stopped the craft for a few minutes while he related a fanciful tale about pirates. Adults might smile, but the children listened eagerly." According to Hayworth the boats name was the "Ida F." Whitney built steam yachts and launches in Boston. He designed and built a small steam engine for automobiles for the Mason Regulator Company. It was one of the first production engines for automobiles. Soon after Whitney was building steam automobiles of his own design. Whitney was an early resident of Big Island Pond and lived at what is stilled remembered as Whitney's Grove. 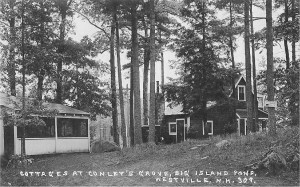 Today, I wanted to share with you to beautiful old photographs of Conley's Grove on Big Island Pond. These photographs were identified by the original photographer as "Westville, N.H. which was the mailing address for Atkinson at the time. Conley's Grove and pavillion were both located in Atkinson, New Hampshire. Hayworth says that, "By the end of the Roaring Twenties people began to explore the world beyond the ethnice neighborhoods of the city. As more and more people bought automobiles, the unerringly headed for the seashore and the country in their time off. The "Big Band" era was in full swing and the dance halls located at lakes and ponds were a strong draw for city-bound people. 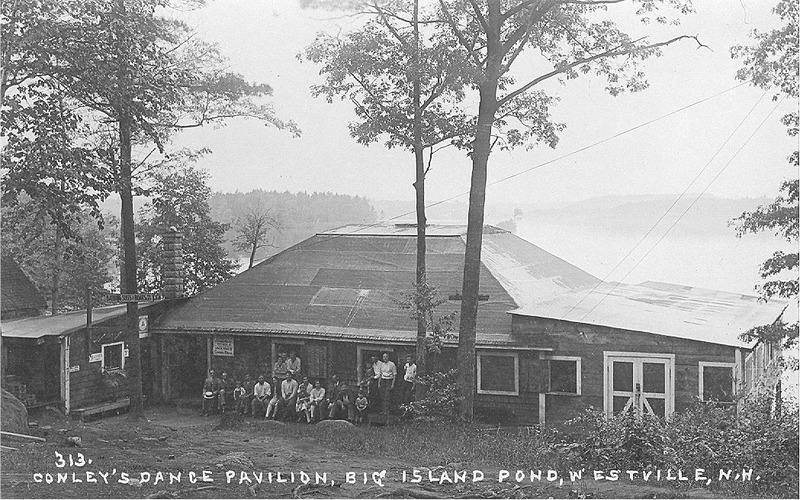 Big Island Pond features two dance halls; one was built on the shore at Conley's Grove and the one at Chases Grove is still active. Working class people were able to afford the cost of a mass produced automobile and people were no longer limited to electric trolleys. Big Island Pond with its scenic beauty and its dance halls became a big draw." The cottages pictured at left were owned by Elsie Lippold. The descendants of the Lippold family still live in Conley's Grove today. Big Island Pond is a beautiful lake with a beautiful shoreline and water depths that reach up to 70 feet. Governor's Island is "the big island" in the middle of the lake for which the name is derived. If you want more information about real estate for sale on Big Island Pond please follow this link. On one of the signs at the front of the pavilion is the name "Jack Mills ___ Orch." Jack Mills Company represented many orchestras in the twenties including Duke Ellington. Another sign on a tree advertises "Bathing suits and boats to let."